Collaboration with Wieden+Kennedy Entertainment, les éditions volumiques, Search Party Music, and Brooklyn Vegan. Enter the mind of Daniel Johnston: Indie music icon, inspiring visual artist, comic book superfan. Space Ducks: An Infinite Comic Book of Musical Greatness is more than Daniel Johnston’s first-ever comic book. It’s a passion project, brought to life through the hard work and collaboration of Daniel Johnston fans across several disciplines. Spearheaded by Wieden+Kennedy Entertainment, the project started with a simple assignment–to help rework Daniel Johnston’s website. But being Daniel Johnston fans themselves, the team saw it as an opportunity to help him create something much more significant. Daniel has always wanted to publish a comic book. The idea was to give him a platform to do just that, and to evolve the resulting opus into a corresponding app that would launch his new album in a big way, combining all of his amazing talents: his art, his music and his uncanny ability to inspire others. Featuring the voices and music of several prominent indie musicians, and fans of Daniel, including James Mercer of the Shins, Yo La Tengo and Unknown Mortal Orchestra, the Space Ducks app allows users to play their way through the comic narrative, game by game, chapter by chapter, unlocking animated films and Daniel’s new album as they go. 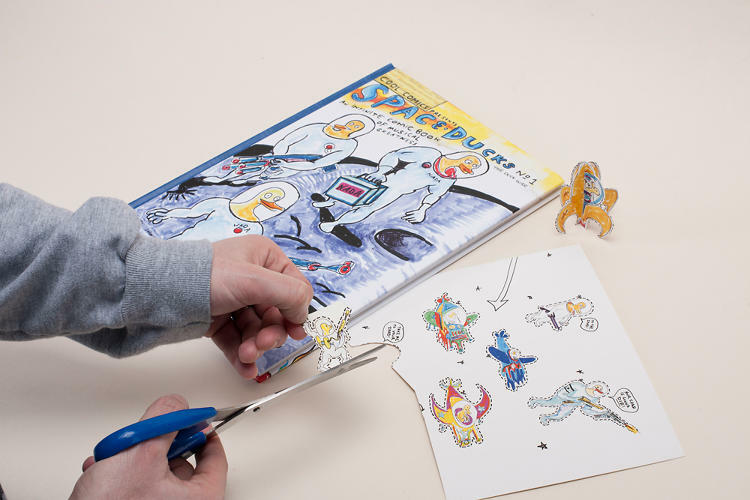 In addition, game pieces can be cut from the hard copy of the comic and placed on the iPad screen to play the games, taking the Space Ducks experience to a new level. The Space Ducks comic book can be purchased at comic book shops worldwide, on the Space Ducks app and at hihowareyou.com. The app can be downloaded for free in the iTunes Store. Both will launch at this year’s SXSW in Austin, Texas, at The Belmont on March 13 at Daniel Johnston’s Space Ducks launch party. The comic was published by BOOM! Studios. The app was built in conjunction with French digital developers, les éditions volumiques, with music and VO talent curated by Search Party Music and Brooklyn Vegan. The entire project was made possible through partnership with Primary Wave Music and Eternal Yip Eye Music.